Shankar Shrestha/Republica A general view of the model village built in Dhola of Dhading by Dinesh Tamang’s team in this recent picture. DHADING, April 20: At a time when the Dhurmus - Suntali duo is in the spotlight for their untiring efforts to build houses for the needy, another man from Lapa village of Dhading district has also been doing great wonders. 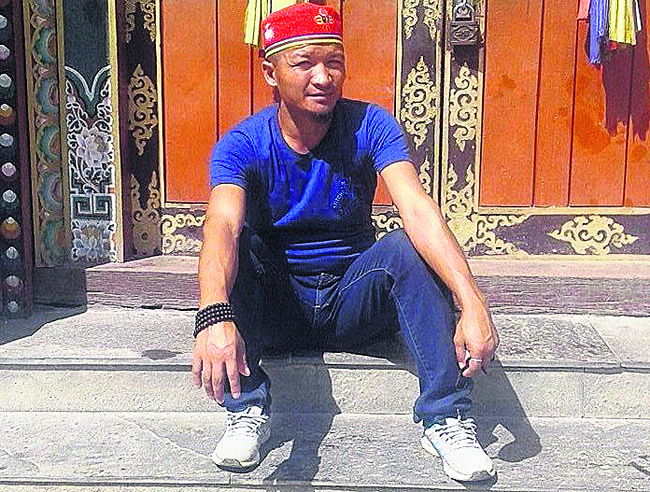 Dinesh Tamang, 36, who took initiation for constructing a model village, consisting of two settlements, for earthquake victims 16 months ago has completed the task and handed over the 55 houses to the targeted families. Several organizations helped Tamang financially while the victims contributed a lot technically. 26 of these houses are in Alegaun settlement and 29 of them are in Bhuwalepani. Over 300 members of the 55 families have been given those houses. According to Tamang, those people are from the remote Rubivalley village council. “Many others too needed such help. But we had to give it to the neediest. These families are from one of the remotest area of the district whose houses were destroyed by earthquake and lands were washed away by landslides,” Tamang said. Post earthquake, these families had come to Aleguan and Bhuwanepani in search of a safe place and were living there in makeshift huts until they were handed over the new houses. “For building houses we first needed to buy land. With the support provided by a Canada based organization, Child Heaven International, we bought 38 ropanis of land by paying Rs 2.9 million,” Tamang said. 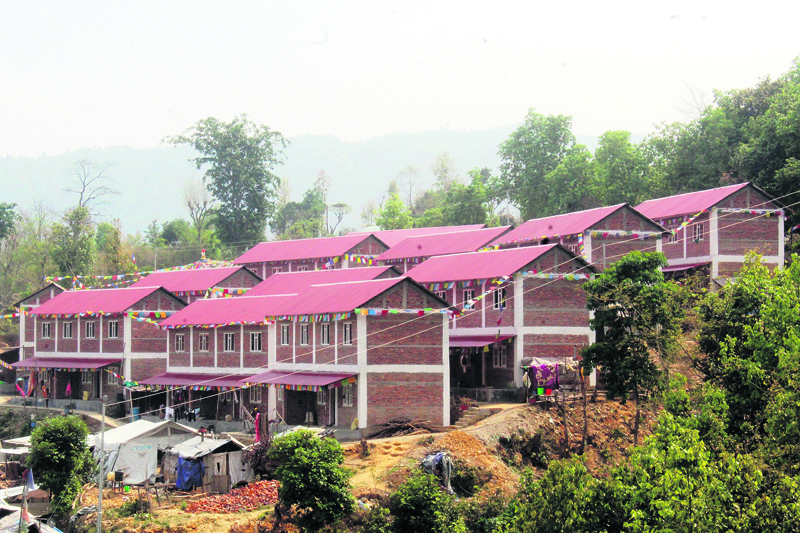 Each of the 55 houses were built at the cost of Rs 1.4 million where each of the beneficiary family contributed labor worth Rs 400,000, Tamang informed. “Except for major technical works, the families did every possible physical work. This, if converted to money, equals to around Rs 400,000,” he stated. Tamang’s team has handed over the house ownership paper to the families with a condition that restricts them from selling it. “They are their house and it was built so that they could live happily in it, not for selling it. So ownership contract restricts them from selling it, doing so would be against the very purpose of building them,” he said. Apart from the individual houses, the settlements have a community health center, study center and a park for children. Since most of the families are Buddhist, there is a Gumba at the entrance, as well. Along with that the houses have been equipped with rain water storage system. How did Tamang do this ? A resident of Newer village of Dhading, Tamang, was away from home when the devastating earthquake hit on 25 April, 2015. As a health assistant he was at Nawalpur health post in Sindhupalchowk providing service. The eldest son of Karna Bahadur and Sirimaya, Tamang also had a narrow escape from death that day. According to locals, he was always a very helpful man and won their hearts. However, after the earthquake, he became even more focused on social work. People who know him said that he looked restless until he completed the housing projects. “He was overwhelmed with the pathetic condition of children and earthquake family victims in the temporary camps. He wanted to do something for them. And he did,” said one of the recipients of the house. Tamang, however credits Boni Capsino, a Canadian national for the initiative. After Tamang reported the woes of the quake victims, the 96-year-old Capsino could not stop helping. “She collected Rs 2.9 million donation in Canada and provided that to us. 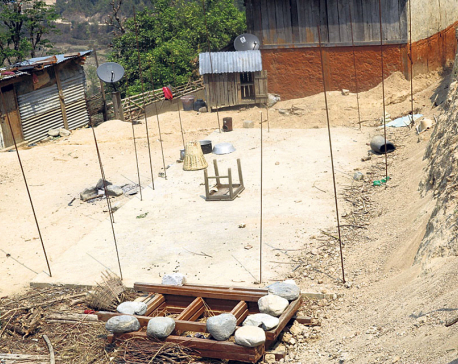 The funds helped us procuring the land that we needed badly for building the settlement,” Tamang said. Many other organizations later extended their support for constructing the model village. According to Tamang, the village came to life due to the generosity and kind people of several countries. “While different organizations give us financial support, the victims themselves worked with great zeal. Even old aged people did not sit idle. They would do whatever they could,” he narrated. “Similarly, women worked just like men though they also had to look after small children,” he added. The families who moved into their new homes are now planning to start home-stay service for tourists. This was a part of the master plan conceived to empower the beneficiaries economically also, Tamang said. “These families are very poor as they don’t have any reliable source of income. Good thing is, the locality has potentials to tourists if we bring few things on track,” he said. “We discussed this potential while we were constructing the houses and they are excited to start this venture,” he added. There are many single women among these victims. They have bben struggling more than others to earn a living. Tamang informed Republica that plans for establishing small cottage industries for the interested families are underway. “Poultry and vegetable farming are two viable options to generate income for these families. We are exploring other available options that could help these families have a stable source of income,” he added. Tamang called on genuine organizations and personals for reaching out to the village and offer support and technical training to the villagers. While sharing his wish to extend such support in other parts of the district, he said people can do great things if their intentions are genuine. “We welcome genuine support. 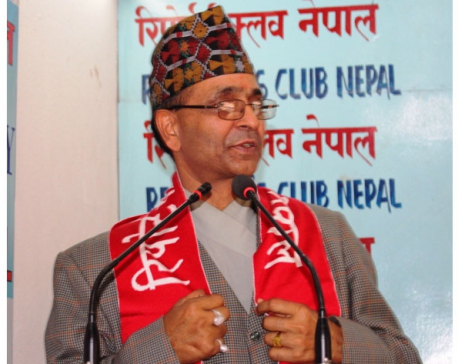 We are thinking of building 100-house settlements in Lapa, Setrung, Tipling and Ri VDCs,” he said. “Illiteracy and lack of resources have pushed us behind. But this cannot be an excuse, we must break the barriers and this is possible with the help of genuine support from individuals and organizations from within the country and beyond,” he added.